‘Grassroots’ organisations can make a difference. Brexpats – Hear Our Voice (BHOV) won a European Union award relating to their campaigning involving cross-border cooperation and ‘’concrete expression to the values enshrined in the Charter of Fundamental Rights in the European Union’’. From tiny acorns mighty oaks grow. 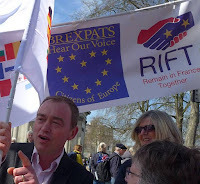 Brexpats – Hear Our Voice (BHOV) is not ‘just an anti-Brexit’ group. Rather it seeks that the EU, and the UK Government, maintain the rights of the millions of British citizens currently living in other EU countries and also the rights of the millions of EU citizens currently living in the UK. They have done much and achieved much. The group as a collective wrote and distributed a letter to all politicians in the UK and the EU Parliaments and some media outlets, raising the concerns of EU Nationals living in the UK and UK Citizens living in the EU post the Referendum Result. The original letter was redistributed (shortened and slightly adapted) to all recipients as stated above but also the new DexEU, Cabinet Ministers and some EU Commissioners’. Some great responses from UK and EU MEPs, significantly Jean Lambert MEP. Written evidence was submitted to the British Future inquiry and their report. An invite to speak in person with Jean Lambert MEP at the EP was received and conducted. A very productive meeting ensued, which resulted in a continuing relationship. An invite received (and accepted) from Jean Lambert MEP to speak at a Forum on Freedom of Movement in London on 11th November 2016. Freedom of movement from Jean Lambert MEP on Vimeo. Brexpats attended and presented at the Green Party Forum the Freedom of Movement Research. BHOV assigned a ‘petitions coordinator ‘ who led the promotion of such. Some of the petitions broke the 10,000-signature mark . BHOV signed “the Pledge” for the 3 million. This was handed to the Prime Minister’s Office and coverage by many media outlets was gained. ‘Concerted Plea’ video completed and distributed to all politicians. The House of Commons Select Committee for exiting the EU inquiry was held in London. BHOV were part of the oral evidence session. The group was a co signatory, involved in providing feedback and distribution of the "Alternative White Paper"
Brexpats – Hear our Voice (BHOV) was mentioned in the 2nd report published by the Exiting the EU Committee. Joint evidence with Remain in France Together (RIFT) was submitted to the House of Commons Procedure Committee inquiry into “Delegated powers and the Great Repeal Bill”. As part of The Coalition of UK groups “British in Europe”, BHOV met with the Department for Exiting the EU twice. They met and spoke at a forum in London with the EU President Tajani. Brexpats – Hear our Voice (BHOV) campaigning and influence will continue. They work in coordination with ‘sister’ organisations RIFT and Bremain in Spain. BHOV has made a difference; we can all make a difference, so never give up on supporting your EU ideals. UPDATE: the BHOV founder has started a Facebook group British in the Netherlands for UK citizens, whom are concerned about their future rights, where they can share worries, share information and form a lobbying unit. Breaks-it and a victory toast for the UK?